Dhaka, Jan 2 (Just News): Living cost rose by 8.44 percent in Dhaka in 2017 because of hike in prices of rice, vegetables, house rents, electricity, gas as well as other services, said Consumers Association of Bangladesh (CAB). The latest spike was higher than in 2016 when cost of living rose by 6.47 percent and cost of services went up by 5.81 percent respectively. The consumers’ representative body said it has not included expenses on education, health and real transport in its estimate. 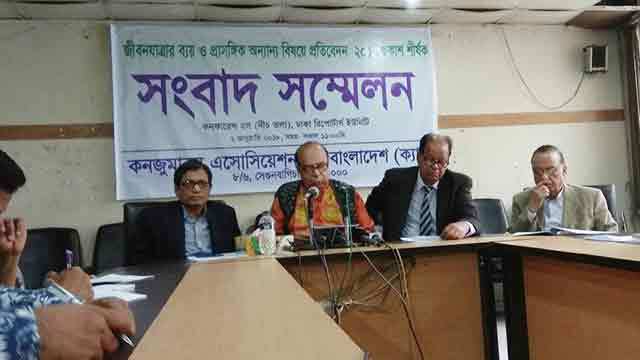 Food prices particularly rice soared at higher rate in 2017 than the previous year, said CAB President Ghulam Rahman at a press conference at Dhaka Reporters’ Unity (DRU), unveiling CAB’s annual report on cost of living in Dhaka. In 2017, cost of services including electricity, gas and water increased by 7.17 percent compared to the figures from 2016, said CAB. House rents went up by 8.13 percent in 2017 compared to the previous year, it added.